Most large children's ministries are located in areas that have a large population base. It makes sense, right? The more kids and families that live in your town, the more you have the opportunity to reach. 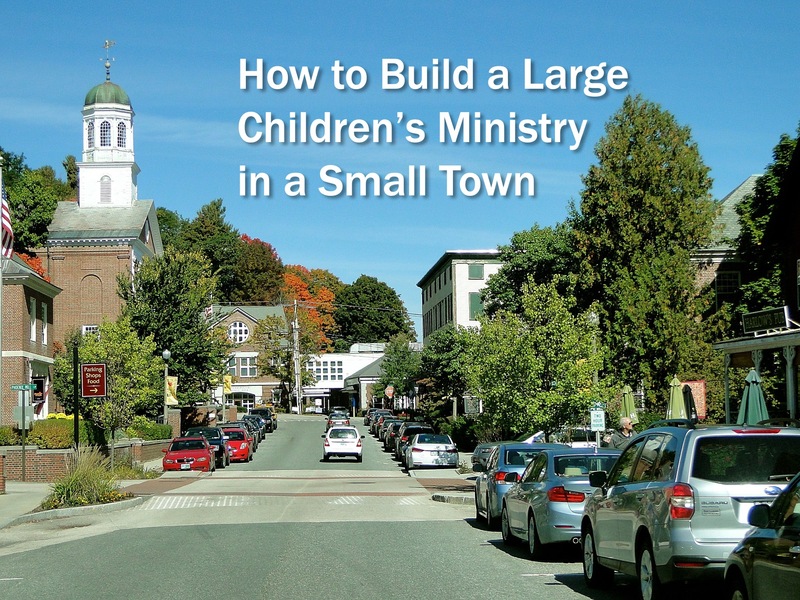 When you think of a large children's ministry, you probably don't think of small town U.S.A., right? Recently I was at a large church that breaks the mold of small town...small children's ministry. The church, Faith Church, is located in Artesia, New Mexico (population 11,921) and yet, in this small town, they are reaching hundreds of kids. My friend, Paul Dunbar, is the children's pastor there. I interviewed Paul and asked him to share how they are reaching hundreds of kids and families in a small town. Here's what he shared with me. What are some key things you've done to build your children's ministry? I feel like what we've done best to build our children’s ministry is relationships. I am very intentional about inward and outward relationships. We try and build the relationships within our team, through small get togethers, but also with our kids through events where we can all get together and have fun. For the adults it can be game night, food frenzy, or something where we all just get together. For the kids it has varied from lock ins, nerf night, pool parties, etc. That is the inward. Outward, I am very intentional about being in the schools, out at community events, visiting kids ball games, etc. This is not something I do alone, but encourage our team leaders to do as well. All of these different relationships have helped build a strong foundation. How do you make new kids and families feel welcome on their first visit? We have multiple strategies for new kids and families. We have first-time attender gifts, all kids get a first-time visitor letter, I email the parents and or call, but we also try and make a visit. I also try and find out what school they are at and intentionally go visit them in their school. These all let them know we care. Are there any events you do to attract new families? Tell me about your volunteers. How do they help build the children's ministry? Our team (we don’t use the word volunteer) is the best around. I tell them all the time and try and love on them as much as possible. They are so hard working, servant leaders, and just love kids. We try and meet on a quarterly basis so we can all be on the same page. They are the ones that do the hard work. They are the ones in the trenches building the relationships with the kids. I try and focus on our team, so they can pour into our kids. Our team is around 80 team members and are just amazing. I can’t thank them enough and am so proud to get to lead them. What advice would you give someone who is reading this who is in a small town and wants to build a large children's ministry? My advice would be to build relationships. Find ways to connect with the schools, the rec leagues, find a way to get involved and let them know you are there and you care. So many times, me included, will think they will just show up. NOT TRUE. I have to remind myself, if I don’t spend at least an hour a day in our community I am not doing a great job. I try hard every day to get out and go visit. Schools, our team, whoever, but be out and about with the people. What do you do to partner with and connect with parents? We try and be very strategic whether it is fun Facebook videos, remind 101, ministry by text, email, or just a personal phone call. All of these ways help us stay connected with them. We also do family events 2-4 times a year. Events where the parents have to come with the kids so 1. They can see who we are and 2. Give us a chance to get to know them and grow with them. How do you make sure kids are connected, cared for and made to feel valued? We try hard to follow up using reports to track who is missing and make a point to reach out and check on them. The biggest thing I do is try and remind the kids every time I see them that God created them, God loves them, and God has a plan for their life. Our motto or anthem is Ephesians 2:10. They hear that verse every week. Anything else you'd like to share with children's pastors who want to build up their ministry to children? I would remind them they are not alone. Ministry is hard work, but remember it is all about the people, adults and kids. Find ways to be creative, think outside the box, and build relationships as much as you can. If they don’t know you care they really wont care what else you can offer. (Dale) If you are reading this and you are serving in a small town, I trust this has encouraged you. No matter what size town you live in, there are kids and families that need Jesus. Rather than sitting back and being complacent , I want to encourage you to get out of the four walls and get involved in the lives of people. The biggest take-a-way I got hanging out with Paul is this: It's all about relationships. For volunteers, it's all about relationships. For reaching kids, it's all about relationships. For reaching parents, it's all about relationships. For discipling kids and families, it's all about relationships. I can promise you this. No matter what size your mission field is (town) you can reach kids and families if you'll get out in the community and show them you care. Are you serving in a small town? What are some other thoughts you have about reaching kids and families in a small town? Share your thoughts and insight with us in the comment section below.